In the highly competitive world of online bingo, anything that can give a site an edge is a help. A name that already has gravitas in a similar industry can make a huge difference. William Hill Bingo is a site that enjoys this benefit. But a name can only go so far, the name may make you visit William Hill Bingo, but it is the content that will lead you to decide if you want to stay. To know whether William hill Bingo makes the effort that is necessary to maintain the interest of players, one must look at how it looks, what games it offers, and what bonuses you can enjoy. The first of these is arguably the least important, but that has not stopped the site putting effort into its image. The design is pleasant, matched William hill as a brand, and looks exactly like you would expect it to look. Like the majority of bingo sites, the first promotion you can take advantage of at William Hill Bingo is the welcome bonus. What you’re offered is pretty standard, deposit £10, and get £50 to play with. Once you have joined the William Hill Bingo community, you will find there are a fair amount more bonuses waiting for you. Bonus codes, free bingo, and a host of weekly bonuses are available. One thing William Hill does is different, is remember mobile users through its promotions. If you are a mobile or tablet user, you will be eligible for exclusive promotions that are not available to desktop users. Mobile players are often an afterthought for bingo sites, so for William Hill Bingo to do this, is a good step to setting them apart from the pack. 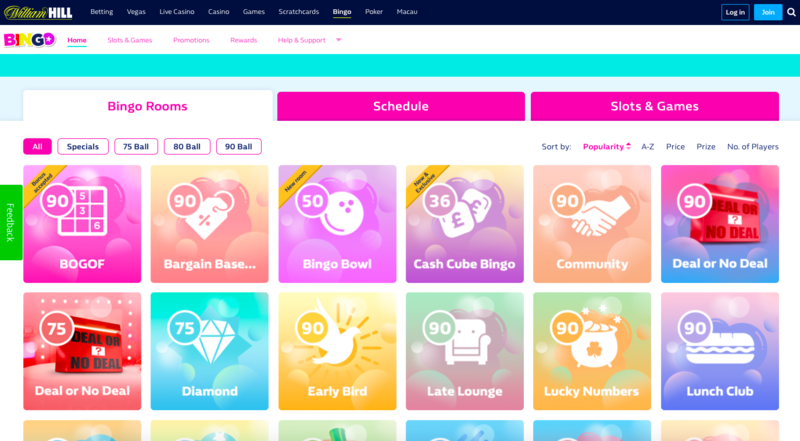 Having competitive promotions is all well and good, but as a bingo site, it is the gaming options on offer that win or lose a win or lose player’s attention. A choice between 90 ball bingo, 80 ball bingo, 75 ball bingo, 75 ball pattern bingo, or variant rooms where any of these games could come up is an excellent start. There is only a certain amount of bingo games you can offer, but William Hill Bingo certainly gives all of the choice you need. There are a host of other games available at William Hill Bingo as well, from scratch cards to arcade games. But as is often the case with bingo sites, the majority of other games on offer are of the slots or casino variety. As far as slots go, William Hill Bingo may not offer the favourites that you know and love (although they do offer some very familiar looking concepts in the slot games available), but the choice is good, and there is something for everybody. The ‘Number Games’ section of the site brings you various roulette games, blackjack, keno, and even virtual horses and virtual dogs. It certainly seems to be apparent that William Hill Bingo are not content to simply tread water and enjoy a certain amount of success through their name alone. Instead they are trying to entice bingo players by offering up new ideas, like mobile exclusive promotions, or a huge choice of games outside of bingo, which promises to be a very clever choice. From the second you visit William Hill Bingo, you know you are dealing with the professionals. There is a reason the William Hill brand carries the weight that it does, and this is clear at William Hill Bingo, a highly recommended site for players of all standards, from the newbie, to the long-time player.